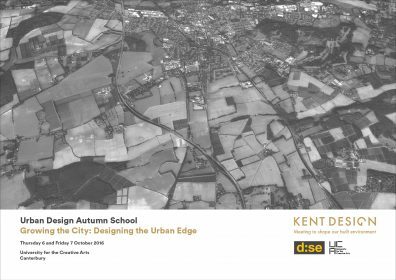 The Urban Design Autumn School offers amazing learning opportunities with some of the UK’s leading practitioners. Using Canterbury as a test bed to speculate about the extension of the city beyond its existing urban perimeter, the intensive 2-day event will develop your skills and knowledge required to face the challenges of planning and designing for substantial growth in historically and ecologically sensitive contexts. Organised by Kent Design and the MA Urban Design course at UCA Canterbury, the programme will introduce you to the latest strategies in creating well-designed, specific, robust and sustainable places. Working in small groups with leading urban design practitioners, you will be coached in developing your own design proposals, taking into account the historical and infrastructural context of the site, landscape patterns, urban design principles, public spaces, and housing typologies. All teams will display their designs in a pop-up exhibition at the Canterbury School of Architecture and present their proposals to a panel of invited critics. A synoptic talk and reception will conclude the 2-day programme.